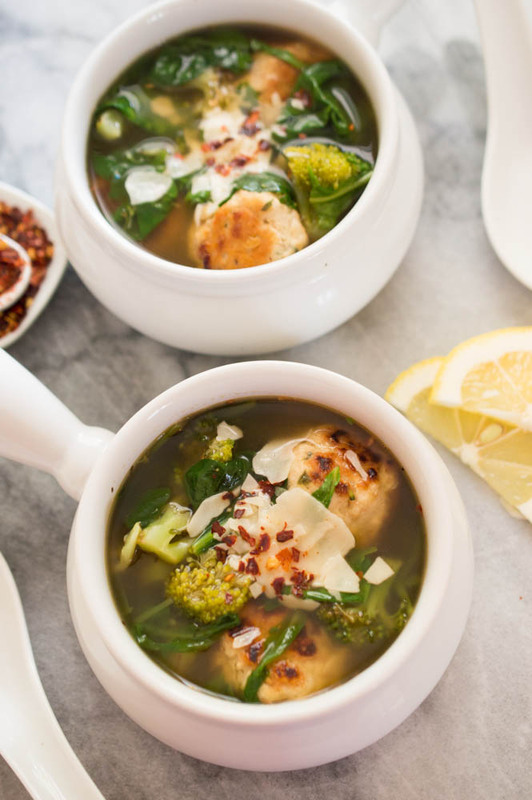 Quick and easy one pot Turkey Meatball Vegetable Soup. Loaded with arugula, spinach, broccoli and turkey meatballs. 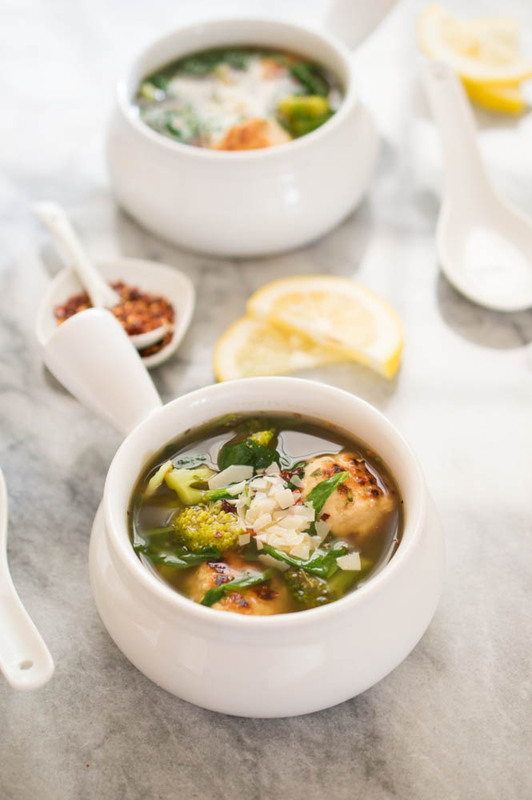 This is the perfect mix of traditional wedding soup and vegetable soup. Hearty and loaded with arugula, spinach and broccoli. The base of the soup is chicken stock and a hint of lemon juice. Crushed red pepper flakes and Parmesan cheese are added to each steaming bowl. I was recently getting over a cold and made chicken soup to sooth my sore throat. My boyfriend made wilted spinach, arugula and roasted broccoli to accompany his meal of chicken and vegetables. I decided to spruce up my soup and add some of his roasted vegetables. I ended up with a hearty flavorful soup with lots of texture thanks to the vegetables. Not to mention the added immune boost. I decided to recreate the soup and add turkey meatballs instead of chicken and no pasta or rice. Trust me you will not miss rice or pasta in this soup. The focus of this dish is the vegetables and the meatballs. This is a one pot healthy dinner option that can be made in less than 30 minutes! 30 minute meals are always the best. Make ahead and freeze for a quick weeknight meal. 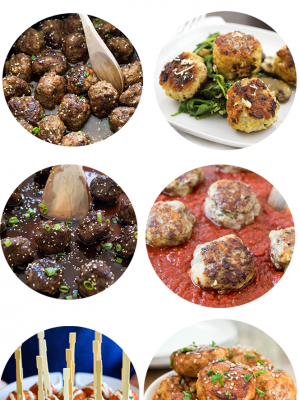 You can also make extra turkey meatballs and freeze to use in soups or with spaghetti. 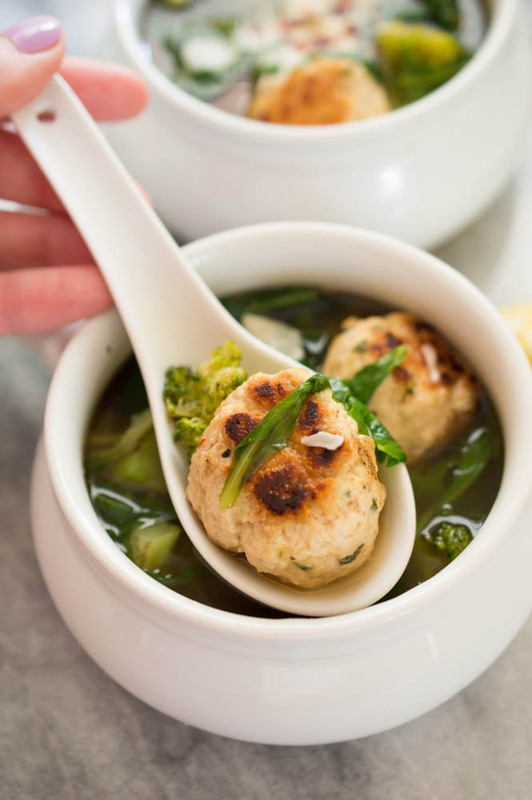 I used one of my favorite turkey meatball recipes for this soup. This soup is warm, comforting and bursting with flavor. These healthy greens are loaded with vitamins and antioxidants. Broccoli is full of fiber to keep you full way past bed time. 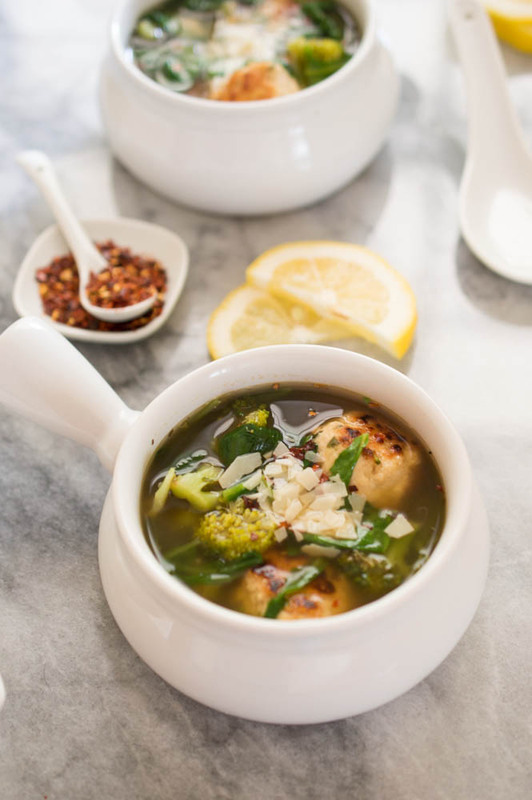 This is the perfect soup to help ward off sickness this cold season. This soup with be sure to satisfy and warm you up on a chilly night. Top with Parmesan cheese, red pepper flakes and a squeeze of lemon juice. I like my soup on the spicy side so I serve extra crushed red pepper on the table. Feel free to add any vegetables you have on hand. Carrots, onion, zucchini, or tomatoes would go great with this! If you like this soup you will love my Classic Tomato Soup and my Thai Coconut Soup. In a large bowl combine ground turkey, breadcrumbs, egg yolk, salt, pepper and dried parsley to make the meatballs. Mix to combine. Heat a large pot over medium-high heat with 1 tablespoon olive oil. Add 1 tablespoon of oil to the same pot. Add broccoli and saute until slightly tender, 3-4 minutes. Pour in chicken broth and bring to a simmer. Simmer soup for 5 minutes and turn the heat to low. Season with red pepper flakes, pepper, salt, dried parsley and onion powder. Stir in lemon juice, arugula and spinach. Cook until wilted. Return the meatballs back to the pot and reheat. Serve with a sprinkle of red pepper flakes and Parmesan cheese. 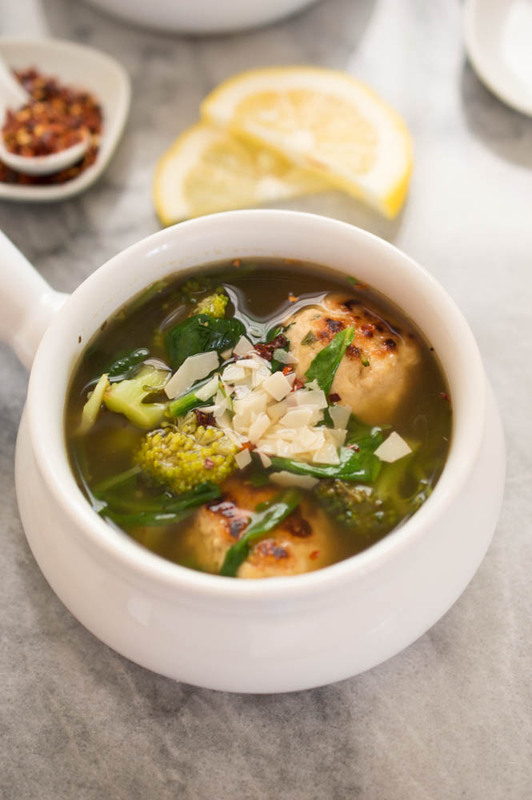 This soup looks amazing and I must try it soon, since it is soup season for me 🙂 It is amazing how great ideas come when you least expect them, like this soup! Pinned! I have a strong desire to slurp up that soup from those cute bowls! No spoon necessary. The perfect comfort food! This soup looks incredible, Kelley! I love that you combined wedding soup and vegetable soup together. And even better that it’s a healthy, 30 minute meal! 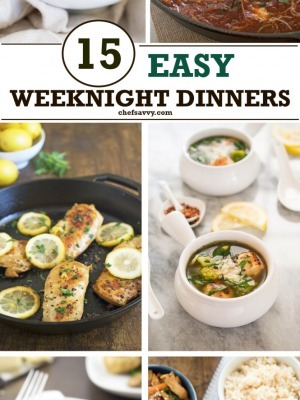 So perfect for busy week nights! Pinned! What a fabulous dish to warm up to this fall and winter! Love that it’s light and is ready in 30 minutes. Must haves in my life! l LOVE clean flavors in a soup like this one. So satisfying and so delicious. This soup looks perfect! I can’t wait to make it! Thanks Annie. I hope you enjoy! I love meatballs and I love soup…why have I never put the 2 together?! You, Kelley, are a pure genius! Can’t wait to faceplant into a bowl of this on a cold Seattle night! Pinned! Thank you so much Taylor! Who knew meatballs and soup are the perfect match?!? This is my kind of soup Kelley! I love all those veggies you have in there. I can see why this made you feel better when you were sick. I haven’t gotten sick yet this year, and am getting my flu shot on Tuesday to be extra careful. But, I’m sure it won’t be long until I wake up with a sore throat. This will be a great way to getting me feeling better quick. And thanks for commenting on my blog! Just added you to my reader, looking forward to being internet friends and can’t wait to see what you cook up next! Thank you so much Natalie you are so kind. Looking forward to reading your blog as well! The cold is certainly going around our house, and soup is one of our go-to meals. I love the meatballs in this soup, and of course, you can’t go wrong with all the vegetables. Yum!